Straight forward modern style with identically spaced vertical bars using a bottom rail, and newel posts with a small lamb's tongue on the end of hand rail. ..
Ornate scroll pattern framed with bottom rail and a top smaller scroll border to create an elaborate design. .. This beautiful scroll rail was created with a bottom rail and a top smaller scroll border. The termination scroll on the starter step and the pewter color choice gives this railing the elegance to resemble an intricate sterling silver bracelet wrapped around the architectural design of the home. 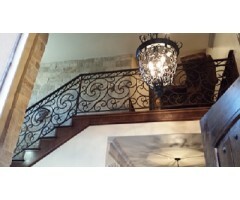 ..
We designed a top, bottom, and side border on this lovely stair rail. Using a large medallion in the center of each of the side borders creating visual eye candy to this already gorgeous architectural work of art. 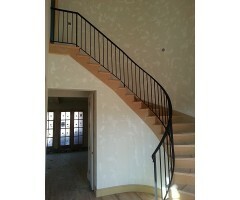 The curved balcony rail at the top of the staircase, and the turn-out volute stand on their own as a visual delight! .. The pewter color on this alternating single and double tri-collared round bar attached to a bottom and top rail completed with a volute on the starter step. .. 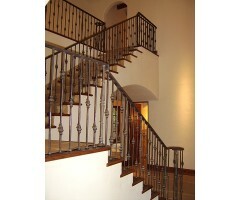 Single, double, single, is the repeat pattern of balusters mounted on a bottom and top rail. It is then attached to the skirt and wood handrail to finsh this elaborate staircase surrounding a glass elevator. .. This is a photo of the balcony rails for the staircase shown in ST-054 with the same beautiful scroll panels bordered on all four sides with a center medallian piece. .. This modern custom rail was created with artistic flair to give this home a unique center show stopper. Note: we offer matching baby or pet gates to attach to the top or bottom of the staircase if you'd like to consider this option. .. 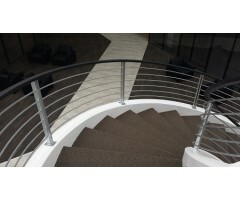 The balcony rail for the stair photo ST-057 .. This contemporary stair rail was designed using 1-1/2" x 1/4" dual bar for the vertical posts, 3/8" solid round for the horizontal bars, and 1" x 2" rectangular bar bent to the radius for the handrail. 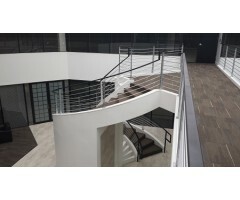 Top handrail was painted black satin while the lower components a nickel tone to create a clean, open, sleek design to this commercial building. .. 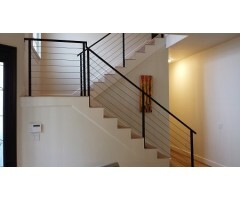 Please see description of this contemporary stair rail under ST-059 which is another photo of the same project. .. Contemporary modern design with 8 horizontal nickel tone round bars. Square vertical posts and the top rail were finished in satin black to create contrast for visual appeal. ..